Pension Drops is situated in Vranov nad Dyjí, near the centre (3 min. walk) at the border of the National Park Podyjí. It takes 10 min. to walk to a dam (5 min. from a pedestrian area). Pension is located in a terrace line and is south-orientated with a beautiful view of the Vranov nad Dyjí Chateau. 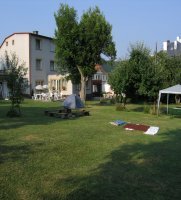 A well maintained garden (approximately 80x40 metres) is a part of the pension which can be used for summer games as well as camping with all the advantages of a family camp (we are in a Dutch registry of small family camps). Besides these advantages, the garden includes a swimming pool for children, sand-pit, swing, fireplace, summer sitting place, etc…. Pension also includes a common TV room for social activities, equipped kitchen, cycle-store and other services which can be provided by agreement. Rooms are sensibly equipped according to clients´ needs, there is a washbasin in every room, sanitary facility is placed in the corridor and is common for some rooms.